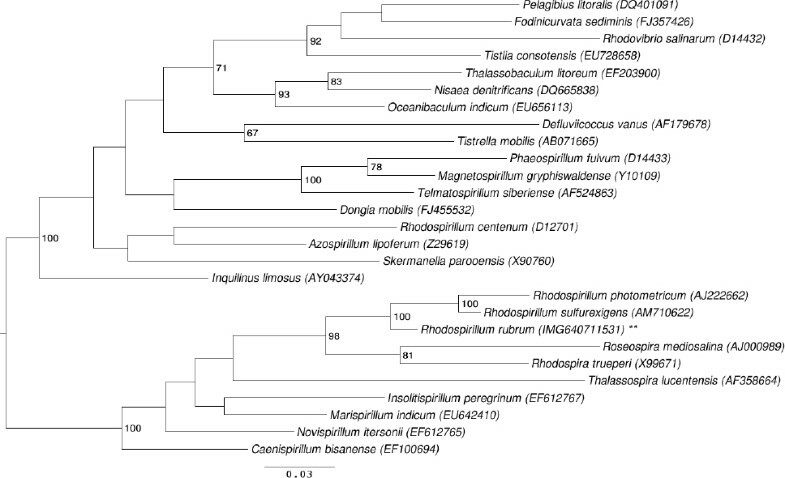 Phylogenetic tree highlighting the position of R. rubrum S1T relative to the other type strains within the family Rhodospirillaceae. The 16S rRNA accessions were selected from the most recent release of the All-Species-Living-Tree-Project  as far as possible. The tree was inferred from 1,361 aligned characters [5,6] of the 16S rRNA gene sequence under the maximum likelihood criterion . Rooting was done initially using the midpoint method  and then checked for its agreement with the current classification (Table 1). The branches are scaled in terms of the expected number of substitutions per site. Numbers to the right of bifurcations are support values from 550 bootstrap replicates  if larger than 60%. Lineages with type strain genome sequencing projects registered in GOLD  are labeled with one asterisk, those also listed as ‘Complete and Published’ with two asterisks. A representative genomic 16S rRNA sequence of strain S1T was compared using NCBI BLAST under default settings (e.g., considering only the high-scoring segment pairs (HSPs) from the best 250 hits) with the most recent release of the Greengenes database  and the relative frequencies, weighted by BLAST scores, of taxa and keywords (reduced to their stem ) were determined. The five most frequent genera were Rhizobium (41.6%), Rhodospirillum (30.8%), Aquaspirillum (6.2%), Rhodocista (4.2%) and Novosphingobium (3.5%) (130 hits in total). Regarding the 16 hits to sequences from members of the species, the average identity within HSPs was 98.5%, whereas the average coverage by HSPs was 97.8%. Regarding the five hits to sequences from other members of the genus, the average identity within HSPs was 95.3%, whereas the average coverage by HSPs was 95.0%. Among all other species, the one yielding the highest score was Rhodospirillum photometricum, which corresponded to an identity of 96.0% and an HSP coverage of 96.9%. (Note that the Greengenes database uses the INSDC (= EMBL/NCBI/DDBJ) annotation, which is not an authoritative source for nomenclature or classification.) 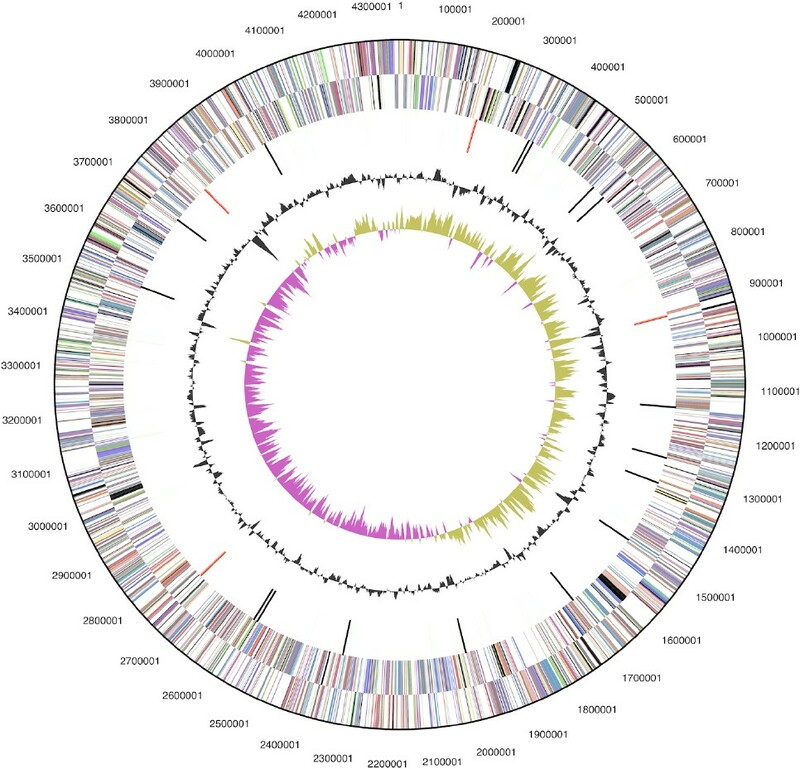 The highest-scoring environmental sequence was AM691104 (‘Rhodobacteraceae clone EG16’), which showed an identity of 91.7% and an HSP coverage of 97.2%. The five most frequent keywords within the labels of environmental samples which yielded hits were ‘ocean’ (2.5%), ‘microbi’ (2.4%), ‘soil’ (2.1%), ‘skin’ (1.8%) and ‘aquat/rank’ (1.8%) (120 hits in total). Environmental samples which yielded hits of a higher score than the highest scoring species were not found. Cells of R. rubrum stain Gram-negative, are motile, vibrioid to short spiral-shaped with a size of 0.8–1 µm (Figure 2). Colonies are purple-colored because the cells contain a carotenoid pigment required to gather light energy for photosynthesis. R. rubrum does not produce oxygen, but elemental sulfur as a by-product of photosynthesis, using bacteriochlorophyll, which enables the absorbtion of light at wavelengths longer than those absorbed by plants. Strain S1T is a facultative anaerobe that uses alcoholic fermentation under low oxygen conditions, but respiration under aerobic conditions. Photosynthesis is genetically suppressed under aerobic conditions; R. rubrum is colorless under these conditions. The regulation of the photosynthetic machinery is still poorly understood, though the organism is phototactic . The RuBisCO (Ribulose-1,5-bisphosphate carboxylase oxygenase) of R. rubrum is highly unusual in its simplicity as a homodimer . R. rubrum is a well-established model organism for studies on nitrogen fixation and the organism possesses two related but distinct nitrogenase systems that utilize distinct metals at the active site . The post-translational regulation of nitrogenase in R. rubrum is relatively unusual in that it utilizes a reversible ADP-ribosylation process [31–35]. 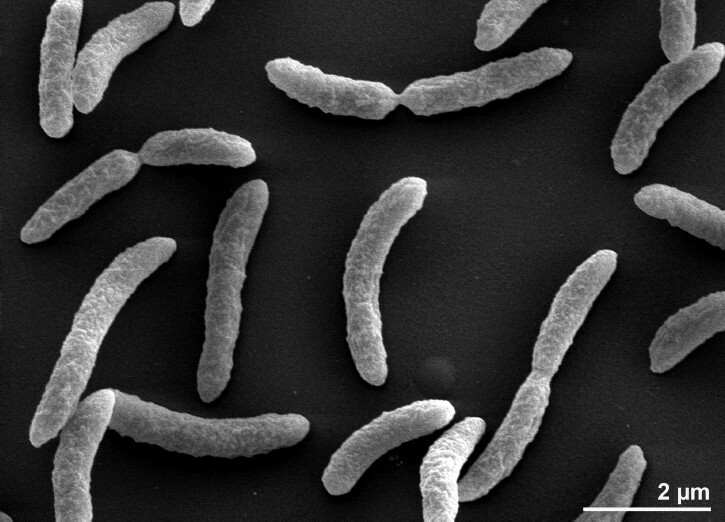 The organism has also been used to study bacterial growth on carbon monoxide as an energy source , and its carbon monoxide sensor, termed CooA, has been the paradigm for such sensors . R. rubrum provides several potential biotechnological applications, e.g. the accumulation of PHB precursors for plastic production in the cell, as well as the production of hydrogen fuel. The composition of the R. rubrum cell wall has previously been reported in various publications. The main fatty acids of strain S1T are unbranched, with unsaturated acids C16:1 w7c (34.1%), C18:1 w7c/12t/9t (32.8%) and C18:1 2OH (6.9%) dominating over a minority of saturated acids: C16:0 (11.6%) and C14:0 (4.0%) [analyzed with a culture of CCUG 17859, http://www.ccug.se].